What Lesson Does “The Big Short” Have for Us? The newly released movie, “The Big Short” based on Michael Lewis’s book of the same name is a fascinating account of several investors who figured out that subprime mortgages would eventually turn bad and made billions of dollars by betting against them. One of the main characters in The Big Short, the investor Michael Burry, could accurately predict when his credit default swaps would pay off. Subprime mortgages started out with a low, fixed two-year “teaser” rate and then reset after two years to much higher floating interest rates. Once the housing market peaked out in 2006 and started to turn down, it became virtually certain that many subprime mortgages would end up in default after the initial two year period because the holders of these mortgages would be unable to refinance in a falling market. 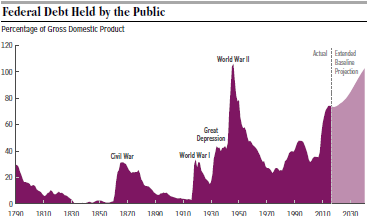 Today we have a very large debt bubble as illustrated in the above chart from the Congressional Budget Office. Why is this so serious? Right now our public debt (on which we pay interest) is “only” 74% of GDP but it is likely to keep getting worse in the coming years as clearly indicated by CBO. Congress has the ability to reduce deficit spending and shrink the debt but does it have the will to do so? Right now our debt is almost “free” money because interest rates are so low. But this is already starting to change and we should assume that interest rates will eventually return to normal historical levels of about 5%. When this happens, interest payments on the debt will surge from about $250 billion per year at present to double or triple this amount. This will make our deficits and debt grow even faster. The debt bubble is much more dangerous than the housing bubble from ten years ago because its bursting will affect the whole economy and not just one sector. It is unlikely that anyone will be able to pull a Michael Burry and predict the exact timing of the burst. But this doesn’t mean that no one will try. When China and Japan (our biggest foreign lenders) start shorting U.S. debt, it will serve to hasten the downfall of our whole financial system. Conclusion. This is an intentionally scary scenario. Things don’t have to happen this way but it’s going to require an enormous effort to turn it around. Are we capable of doing this? This entry was posted in Congressional Budget Office, credit default swap, debt, deficit, Jack Heidel, Michael Burry, Michael Lewis, subprime mortgage, The Big Short and tagged credit default swap, debt, deficit, Deficit spending, fiscal responsibility, jack heidel, The Big Short by jackheidel. Bookmark the permalink.